At the outbreak of WWII, a young Polish doctor was finishing his medical studies and looking forward to using his skills for the well-being of his fellow citizens. Little did he know he was on the verge of an event so large it would change the course of history. Eugeniusz Sławomir Łazowski was a Polish physician responsible for saving 8,000 Jews from certain death in the concentration camps of Nazi Germany. When the war was declared, Lazowski was drafted into the Polish Army as a Second Lieutenant on a Red Cross train. After the quick collapse of the Polish Army, he went into hiding, ultimately joining the resistance, which was in desperate need of capable medical staff. In the meantime, Lazowski’s friend and colleague, Stanislaw Matulewicz had made a discovery. Following experiments, he concluded that by injecting dead typhus cells into a patient they would not have any symptoms of the disease nor the disease itself. However, a blood sample would contain the bacteria and therefore test positive for typhus. It may not sound like much, but in occupied Poland, it became a clever way of saving thousands of lives. Matulewicz proved his discovery on a friend who obtained special leave from a work camp in Germany. His friend was willing to try anything, as he was certain he would not survive the hard labor he had been given. When the doctor injected him with the vaccine, he tested positive for Epidemic Typhus. The results were sent back to Germany, and he was relieved of his duties in the work camp. More and more people were vaccinated, and less returned to the work camps. Jewish street in newly established ghetto in Radom in occupied Poland. Circa 1940. Nazi Germany feared epidemics, as such diseases were hard to control or eradicate in wartime conditions. Typhus was one of the most dangerous diseases of the 20th century. It claimed hundreds of thousands of lives all over the world during and after the First World War. Lazowski, knowing of the fear the Germans had for the disease, came up with a plan to stage a false typhus epidemic in Poland. He could prevent the Germans taking prisoners, as they would rather isolate the “sick” into quarantines, than risk any contact with them. He operated in a town called Stalowa Wola, where the Rozwadow ghetto had been established. He knew he could not inject his Jewish neighbors with typhus, as the Germans would simply massacre them all to avoid an epidemic outbreak. Instead, he injected the vaccine into the inhabitants of neighboring suburbs, who were Poles. That way the whole town needed to be quarantined and the ghetto became untouchable. 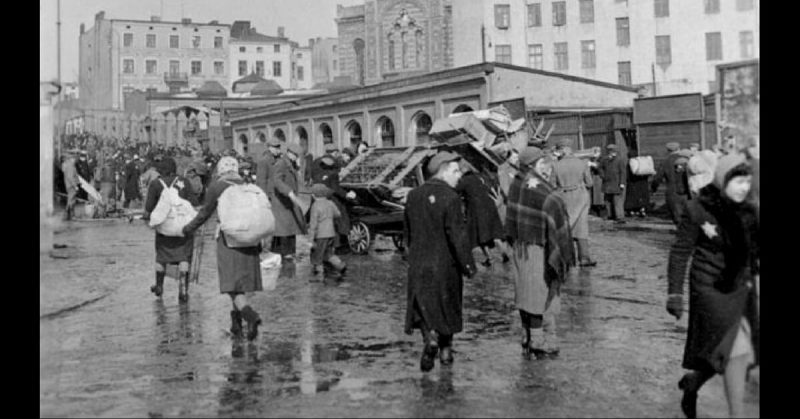 The Germans assumed the illness would eventually infect the ghetto and do their work for them. To confirm this, a special medical team was sent to Rozwadow, where Dr. Lazewski welcomed them. They were offered food, which they accepted, and then collected numerous blood samples with haste. As the blood samples all showed signs of typhus, the case was proven. Rozwadow and the surrounding villages were quarantined. Lazewski had outwitted the Nazis. His actions could easily have gotten him killed. Aiding Jews was punishable by death during the occupation of Poland. Towards the end of the war, however, the Germans became suspicious as the sick were not dying. All clues led to one person; Eugeniusz Lazowski. He was tipped off to leave town by a German soldier he had previously helped. With his family, he managed to escape to Warsaw. German soldiers reportedly began killing Jews from the ghetto after that, but thankfully, the war ended before they could claim many lives. After the war, Lazewski settled in the United States where he became a Professor of Pediatrics at the State University of Illinois in 1976. He wrote his memoirs entitled My Private War upon which a TV documentary was made in 1990. The program included testimonies from the people that survived the war thanks to him. Eugenisz Lazewski, later renamed as Eugene, was named a Righteous Among Nations by the State of Israel, as one of the many Poles who helped the Jews during the Holocaust.